Can you understand common idioms? They can be confusing. That's because idioms are groups of words with a meaning different from the meanings of their individual words. Some are like short proverbs, expressing the experience of generations in a few words. Many are phrasal verbs, like 'cut back on,' 'cut out,' 'get along with,' 'get by,' 'get off,' 'get over,' 'look up,' 'look up to,' 'look down on'-- and so many others. Some are easy to guess, and some are not. It's worth learning the most common idioms in English since they are used so frequently, in business settings as well as casual conversation. Some of the most common idioms of all are phrasal verbs— verbs followed by a preposition (technically a particle). English speakers use them much more often than the one-word verbs that express the same thought. Some phrasal verbs mean what they say: ‘to look up’ can be to fix your eyes on the sky. More often, the meaning of the expression is not the meaning of the individual words. ‘To look up’ usually means to search for a word in a dictionary or other text. See Phrasal Verb Use for a full explanation, including the difference between separable and inseparable phrasal verbs-- important if you want to use phrasal verbs with pronouns. Probably more than half the English idioms listed on this website are phrasal verbs, both because they are so common and because they're not always obvious. Most are on List of English Phrasal Verbs, A-M and List of Phrasal Verbs, P-W. In addition to phrasal verbs, there are many other English idioms, often based on familiar activities or observations of our bodies and human or animal behavior. Some of these, especially those based on proverbs, are fairly obvious, others are not. The pages on EnglishHints mainly discuss very common, useful idioms that might not be obvious. You can easily look up colorful, less common idioms (like "raining cats and dogs"-- which means raining hard) online. Just put the phrase or expression you want in a search box. To get a hold of someone (= get in touch with them) is to make contact and talk with someone (especially by phone). To get (or keep, or stay) in touch with someone is to establish or maintain communication with them. To get side-tracked is to be distracted and to change direction, turning aside from the plan for a project. The expression comes from the time when railroads were very important in the U.S. When two trains were using the same track, one would have to be moved off the main track onto a short area of ‘siding’ to allow the other to go by. 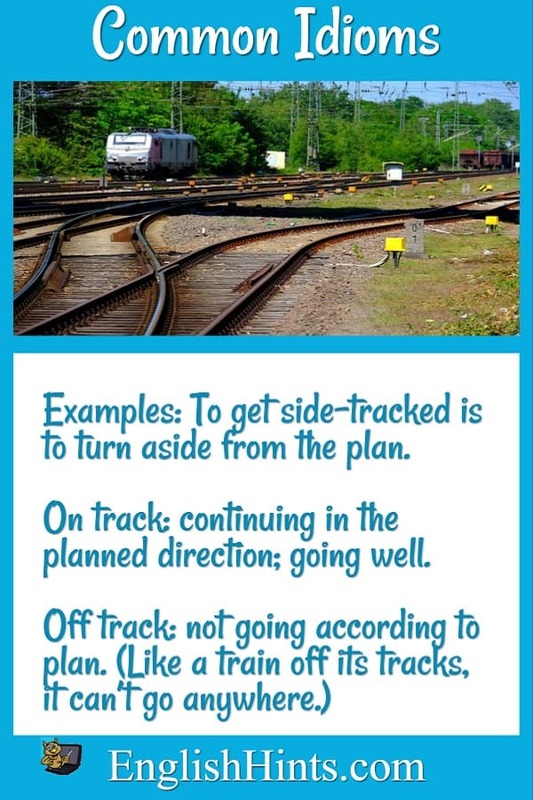 The side track does not lead anywhere; the train must return to the main track to reach its destination. 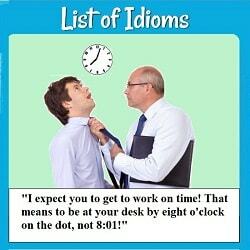 You can find a more complete explanation of idioms and their use in English in What is an Idiom? For an alphabetical list of other common, not-so-obvious, English idioms like these, with meanings & examples, see List of Idioms. Once you have studied some of these idioms, read some conversations using many of them (including many phrasal verbs) in Idiom Examples. Then try some practice exercises on the Phrasal Verb Quiz to check your understanding. If you want to speak fluently with native speakers and understand more of what they say, I highly recommend more detailed study of phrasal verbs. English Conversation Lessons reviews an excellent course that can help you recognize and use 500 phrasal verbs in conversation, in short, practical lessons that will make it easy to understand and remember them. There are two Memory (also called Concentration, or Pelmanism) games practicing idioms at Memory Game 1 )for Phrasal Verbs A-L) and Memory Game 2 (M-Z), as well as a more complete explanation of the rules at Concentration Games for Idioms. If you would like to test your ability to guess idioms in common use which were introduced by Shakespeare see Idioms from Shakespeare: a Matching Game.